Last weekend’s Comic-Con in San Diego gave us glimpses of the new Hobbit and Hunger Games trailers. On Monday, our thirst for more was quenched, and the trailers for The Hobbit: The Battle of the Five Armies and The Hunger Games: Mockingjay Part 1 were released. What happens when two highly-anticipated trilogy trailers are released the same day? We looked at social engagement to find out! Both trailers were released on Monday, July 28th. The Hunger Games fans clicked and shared about the trailer most on that day, causing a 455% increase in shared content for the topic and 559% increase in clicked content. After Monday, clicking and sharing fell off significantly. The Hobbit fans, on the other hand, had the largest increase in clicking and sharing the day after the release, on July 29th. 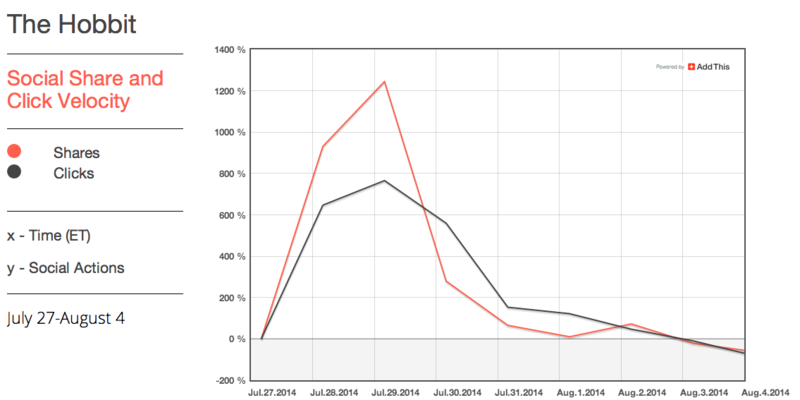 Shared content increased 1,244% and clicked content increased 765%. The Hobbit followed a similar patter as The Hunger Games, and the hype died down as the week went on. One thing the trailers have in common is the service most-used to share content related to the trailer. Between July 27 and August 4, 19% of The Hunger Games content was shared to Facebook and 35% of The Hobbit content was shared to Facebook. The second most-used sharing services for the trailers were Twitter and Facebook Like, respectively. Now we know when users shared the trailers and what service was used to share, but what devices were they using? By far, the most popular mobile operating system for sharing each trailer was Android. Android sharing made up over 80% of mobile sharing for both trailers! 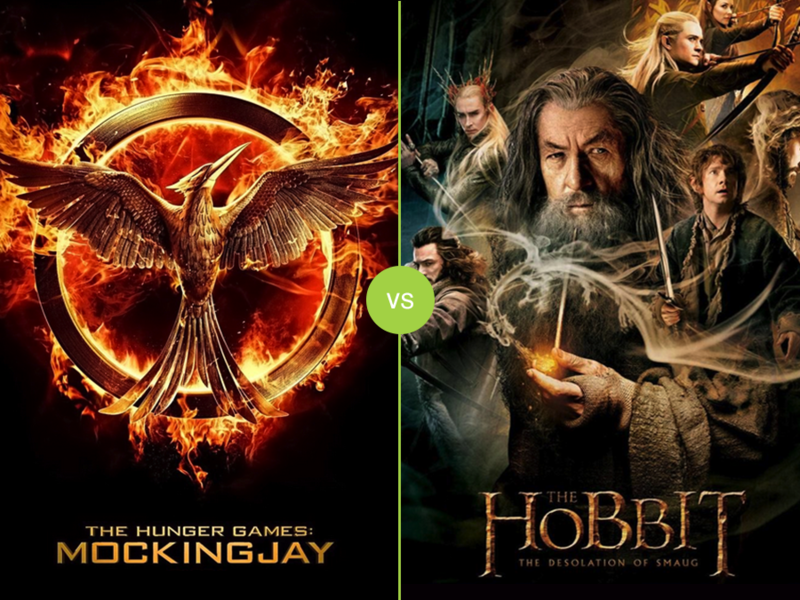 The Hunger Games: Mockingjay, Part 1 and The Hobbit: The Battle of the Five Armies are both trilogy trailers and both fall into the Adventure and Fantasy movie genre, but have very different stereotyped audiences. While the day of sharing each trailer varied, the top service used and mobile device used to share the content was the same. The enthusiasts for these movies have more in common (as far as online behaviors go) than one would initially think. Looking to reach Hunger Games and The Hobbit enthusiasts? We can help! Which of these two movies are you most excited about?